Palmetto State Park, Texas State Park. Palmetto State Park is a good way to spend a day in a setting unusual for this part of Texas. Come here to see the exceptional variety of plants, many tropical, some found no where else in the Southwest. From Alt. 90, go north via US183 and FM1586 to Park Road 11, which is a scenic drive through the park. Cross the two bridges and look for the park headquarters on your left. Pick up a map, or register if you want to explore the park. Or do both. Mail yourself a postcard from the Ottine Post Office. Leave on Park Road 11 North to experience a one-mile drive under a dense canopy of trees. Stop at the scenic overlook and get a nice view of the area. Now you're back on 183. Turn right to return to Gonzales. If you see vultures ahead of you or overhead, look closely. 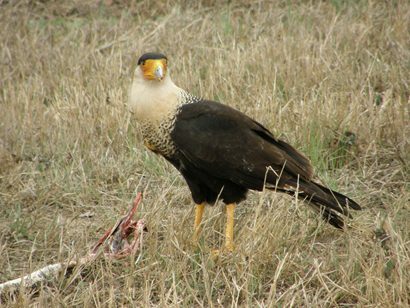 Palmetto has the highest count of Caracaras or Mexican Eagles in the state.